In our Q3 2018 newsletter (And Then There Were None) we highlighted three concerns we felt could ultimately weigh on US markets, causing them to resync with global equities, which have been declining for most of the year. 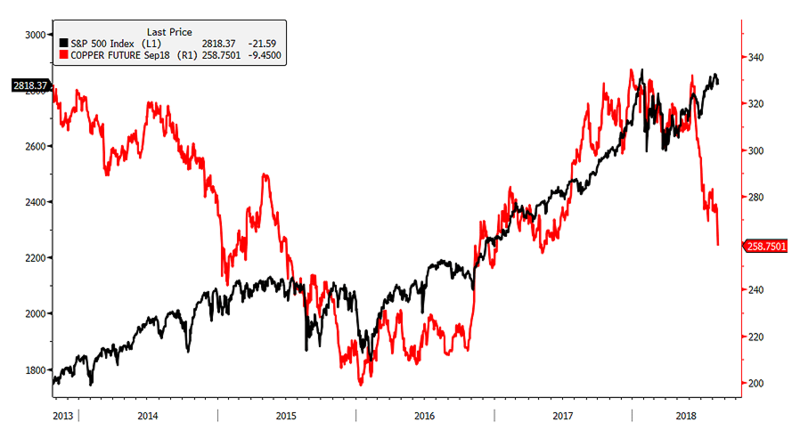 Though we still believe it is too early to make a call for a protracted US bear market or recession, US markets are unlikely to remain decoupled for very long should international problems persist. Since the bull market began in 2009, every major correction in US equities has been preceded by foreign market weakness. 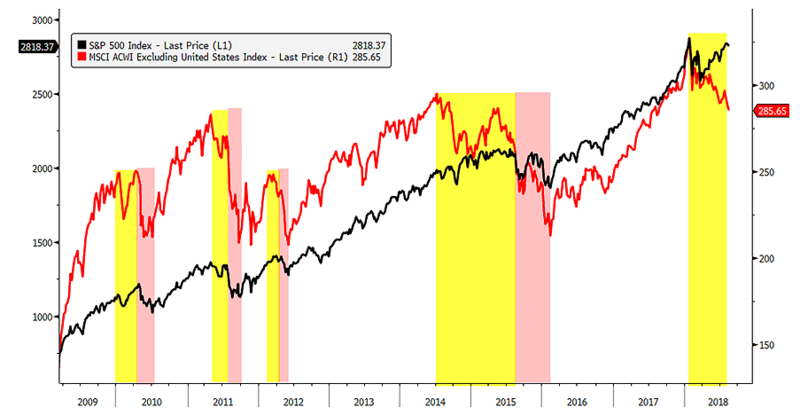 This is highlighted below where weakness in the MSCI World Equities Index Ex US (yellow regions) eventually pulls down the S&P 500 into a correction (shaded red). Since the chart was featured last month, global equities have continued to decline while the US remains relatively buoyant. 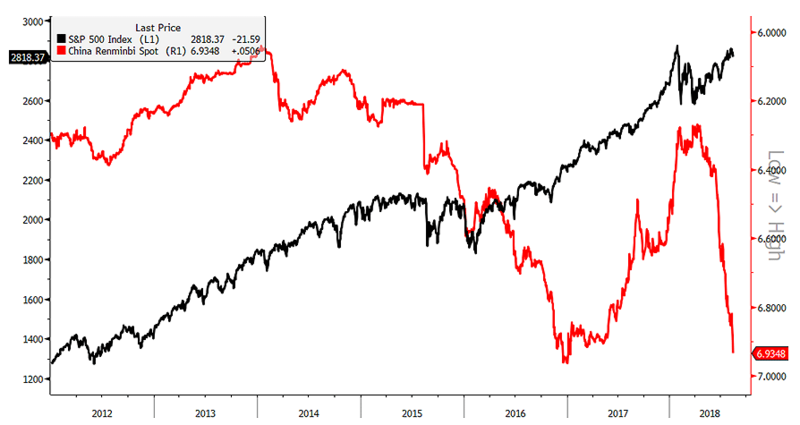 While US equities initially corrected in the early part of 2018, the S&P 500 rallied over 10.7% since the April 2nd lows while global equities continued to sell off. Of the 10.7% rally off the April lows by the S&P 500, Apple (AAPL), Amazon (AMZN), Microsoft (MSFT), Alphabet (GOOG), and Facebook (FB) make up nearly 35% of that rally while the other 495 companies of the 500 within the S&P 500 make up the remaining 65%. Looking at performance year-to-date through 08/14/18 shows AMZN, APPL, MSFT, NFLX, and GOOG made up 53% of the rally. Think about that for a second—1% of the members within the S&P 500 represent 53% of the return while the remaining 99% are responsible for the rest! Heck, Amazon alone makes up 17.6% of the entire S&P 500’s return for the year! Clearly, the market is being pushed higher by only a handful of stocks and rests on shaky ground with a deteriorating global backdrop. Canaries in the Copper Mine? Two other concerns we pointed out that were concerning us and argued for weakening global growth were collapsing copper prices and a falling Chinese renminbi. Copper prices have declined even further since our last report and are quickly closing in on the lows seen in middle 2017. As well, the Chinese renminbi has given back nearly all of its gains since its 2016 lows, falling nearly 7:1 to the US dollar. Given China’s contribution to incremental global growth and commodity consumption, continued weakness in China does not bode well for copper prices nor the Chinese currency. 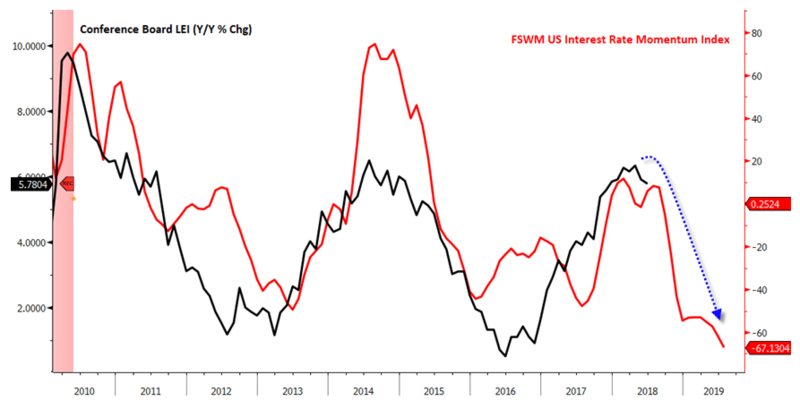 China’s M1 money supply growth rate (red line below, shown advanced) leads China’s coincident economic activity and suggests the slowdown in Chinese growth should continue well into 2019. Source: Bloomberg, Financial Sense® Wealth Management. The economic forecasts set forth may not develop as predicted. 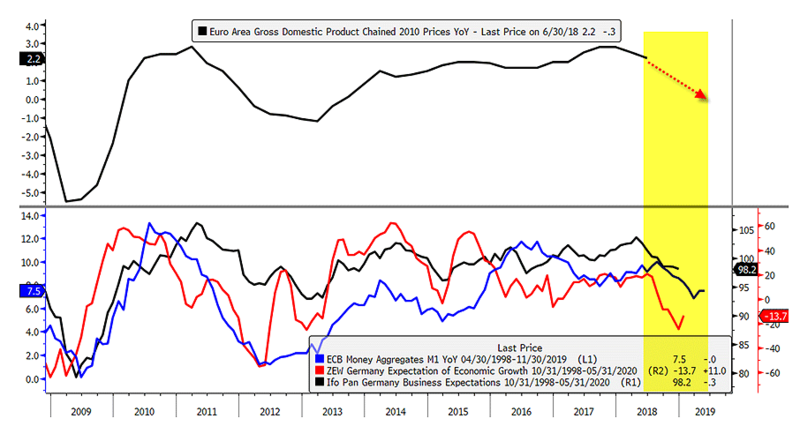 Given China’s importance to Europe as an export destination, particularly Germany, it is no surprise that a slowdown in China as well as slowing ECB M1 money supply growth rates are likely to contribute to weakening growth in Europe heading into 2019. This can be seen below where Euro Area annual GDP growth is shown in the top panel while various indicators that lead European growth are shown below, arguing for a European growth slowdown ahead. While economic growth has peaked in two major regions of the globe, the US so far has been the lone standout. We don’t think that is going to last for much longer, however, and believe we are likely to follow on the heels of China and Europe. In our Q2 2018 newsletter (We Are About to See Who’s Swimming Naked), we argued that we were heading into a growth slowdown here in the US which appears to be underway. In that April article, we argued for a peak in the Conference Board’s Leading Economic Index (LEI) year-over-year growth rate and, so far, it appears that April was the peak at 6.3% with now two straight months of declines since. Our firm’s US Interest Rate Momentum Index argues for the decline of the Conference Board’s LEI to continue heading into 2019. Source: Bloomberg, Financial Sense Wealth Management. The economic forecasts set forth may not develop as predicted. With US economic growth likely to slow, it would make sense for our equity markets to recouple with global equities, which have been in a corrective mode for some time. In our next article, we will look at some likely hot spots that will surface with a global slowdown as well as various investment implications. Stay tuned.